I just wanted to compliment your teachers at New Wave! They've been amazing with our children. Robyn, Zoe and your team really work so well with all the kiddies in gaining their confidence in the pool! They have great personalities in leading their classes and make it a positive, fun step with learning to swim. We've been to a lot of pools around the area and just seem to travel back to your swim school! It's not often you hear positive feedback, so I thought I would send through a message from a happy customer!! Best swim school ever! Excellent teachers and a welcoming environment. My boys love New wave! Great staff, and my little girl loves her Saturday mornings! I was extremely impressed with the level of service from the reception greeting to Emma & Ange in the pool, then to the gentleman at the end giving my daughter a stamp for doing such a good job, and the facilities are great! Really happy to be booking in for the rest of the term! Sincere thanks for the patience, care and skill that you put into coaching Arlo and Maya over the last few weeks. Thank you for taking the time to get to know them, find what motivated them and build a perfect coach relationship. Their swimming has improved incredibly, but just as importantly you've helped them develop a growth mindset that will translate into everything that they do. As a Mum it was beautiful to watch their proud little smiles when the lap/dive/tumbleturn was completed! Thank you and we will definately keep in touch and try and do sessions whenever we are back. 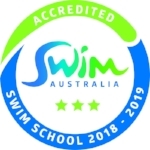 Amazing swim school! Such a family feel and fabulous teachers...really positive environment and fun leasons. My two year old loves New Wave! Thanks guys! Love New Wave! My children learnt, and my grandchildren are learning to swim there!